and offers an online counselling service through video call, instant messaging (text) & email therapy to clients throughout the world. Rob is a U.K.-based, British Association for Counselling & Psychotherapy (BACP) accredited, counselling therapist qualified to degree level in therapeutic counselling. Rob has experience both in areas of general mental health counselling and in the specific area of bereavement and loss. He has a particular interest in working with British ex-patriots living outside of the U.K., having spent periods living overseas himself. 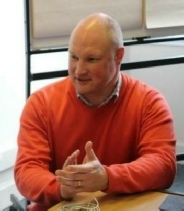 Rob served as an Executive Committee member of the U.K. professional body, the Association for Counselling and Therapy Online (ACTO UK) for over two years, and has received specialist training in online therapy with Online Training For Counsellors (OLT) in addition to his core psychological practitioner training. He is also a counselling skills tutor in a U.K. further education (FE) setting. Ashwood Therapy is able to provide a discreet, professional and private service to those who choose to undertake counselling. The therapeutic work offered by Ashwood Therapy is fully covered by specialist professional insurance, and Rob is registered with the Information Commissioner's Office in the U.K. for the processing of sensitive personal information. You can be assured that your privacy is of the utmost importance. Why not take a look at what past clients and colleagues have had to say about Rob on the testimonials page?